Good Carbs vs Bad Carbs List of Food | What's the Difference? 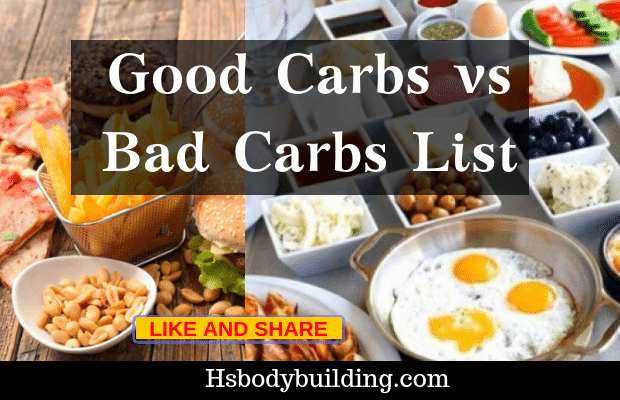 Home / Nutrition / Good Carbs vs Bad Carbs List of Food | What’s the Difference? What is Carb or Carbohydrate? Before I tell you about what is good Carbs and what is Bad Carb. First of all, It is very important for you to understand what actually is a carbohydrate. Basically, carbohydrate is one of the macronutrients. There are three macronutrients protein carbs and fat. And carbohydrate is one of them. The reason why we take carbohydrate is that we need the energy to do work and the carbohydrate is the best source of energy but there are different sources of Carbohydrates some of them are good sources of Carbohydrates and some of them are Bad sources of Carbohydrates and that is what we are talking about in this article. In one gram of carbohydrate, we get 4 calories and it is same as the protein in one gram of protein we also get the 4 gram of calories and I hope you know that the Calories is the unit of energy. I hope now you can understand what is Carbohydrate and what is there a purpose no let’s talk about what is good carbs. After know the short intro carbohydrate no we’ll talk about what is good carbs. Well, basically all the carbs or not the same. There are different sources of carbohydrates That’s why carbohydrate is divided into 2 types these are called simple carbs and complex carbs. The difference between simple carbs and complex carbs is that how quickly they are digested and absorbed in the body. The good carbs or the good source of carbs are those carbs which don’t spike the blood and give energy for a long time. For example, When eating whole grain food The food goes into our stomach and then into the small intestine. Due to the whole grain food contain fiber it’s digested slowly And in the result, the production of glucose occur and then glucose Move into our Body and in results we get energy and we use this energy to do different types of works in our daily life. Now you know what are the good cards no let’s talk about what is bad Carbs. Basically, that comes out those carbs That’s spike the blood sugar and digest quickly And in the result, this process promotes the fat storage. Let me explain this process with you with the example. When we eat refined carbs the food goes to in our stomach and then into small intestine but here is the different process. In this case, due to the Food doesn’t contain any fiber it starts digest quickly in the blood and when this process occurs the more glucose Produce and then this glucose goes to the cells due to this the excess amount of glucose productions Our body cannot use this amount of glucose and then is transferred this glucose into fat. As you see both examples now you not that what is good carbs and what is bad carbs and what are the functions that they perform in our body and what are the results of good and bad carbs in the body. After you know that what is good and bad carbs and what are their functions. Now I will provide you the list of the good carbs and bad carbs. Actually, I will provide you with the sources of the good carbs and sources of bad carbs. 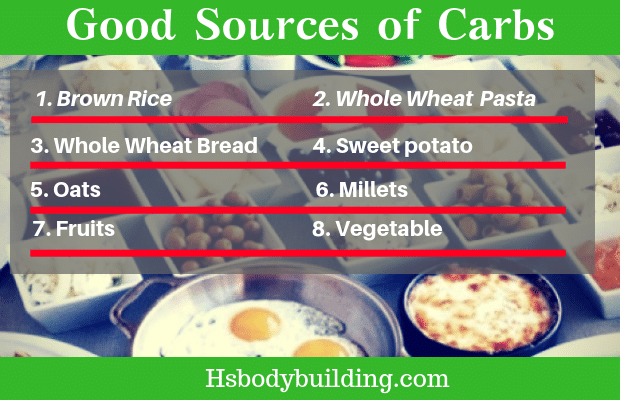 Basically, these sources of good and bad carbs I provide you is according to the whole grain and refined grain carbs. First of all, I will provide you the good sources of carbs. And So on. There is a ton of list of bad sources of cars which nobody can explain in a single article but I can provide you the ideal so that you can understand what is the best sources of carbs some of them I mentioned right in the front of you. Now it’s up to you which one you want to choose but definitely, I recommended you to choose the best sources of carbs so you can get the more muscle mass rather than only getting the bad fat. I hope after reading this article you are most of the questions about the good carbs and bad carbs. 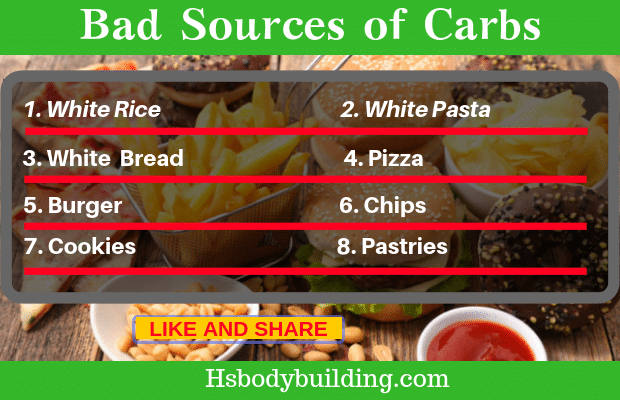 And what are the sources of good vs bad carbs is solved. And You also get something to learn. If you enjoy this article we want you to share this articles with your friends and other peoples to help them to know about the good and bad sources of cards and to support HS bodybuilding.com. Please like our Facebook page and if you have any question related to the carbohydrates or any other questions you want to know the answer just shared this in the comment box below.